Roaring Plans Wilderness Trip Report | "What Goes Down, Must Come Up!" Photo credits to Pyro, Gunny, and Jen. So it was on 17 Oct that Buff and Pyro arrived at my house and we loaded up the truck with a 60% chance of rain and 40F temps hovering over our heads for the next day. But…being ever the optimists and having plenty of sunshine as we loaded up, we once again decided to go for it. Jen and Cartman linked up with us and we were on our way to pick up Gunny in Verona. We set up our camp just off Forest Road 19 and followed the trail, an old gravel road, about 1/4 mile to the crossing of Red Creek. We didn’t see any campsites so we ended up camping on the road and forgot about making a fire. 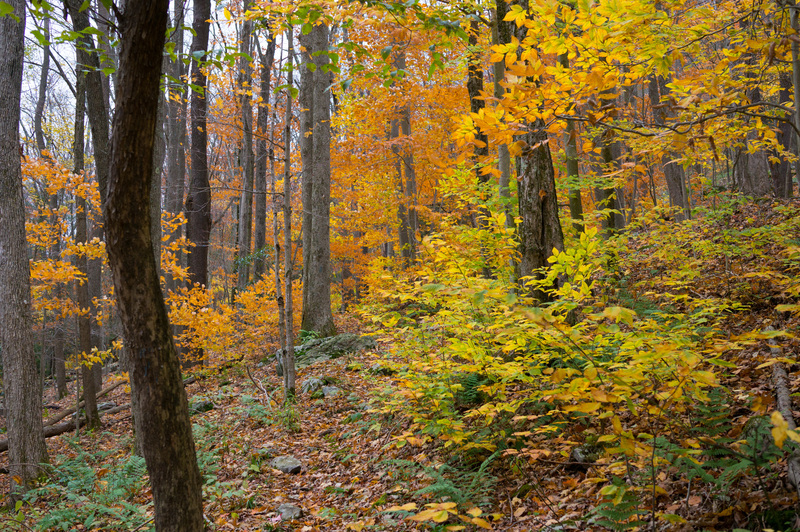 One great thing that happened was that the leaves in this area had just peaked and the colors were absolutely FANTASTIC! We had thought we may have missed out, but we were very-very pleased! Next morning we awoke to partly cloudy skies and temps pretty mellow, probably in the low 60F’s or upper 50F’s. 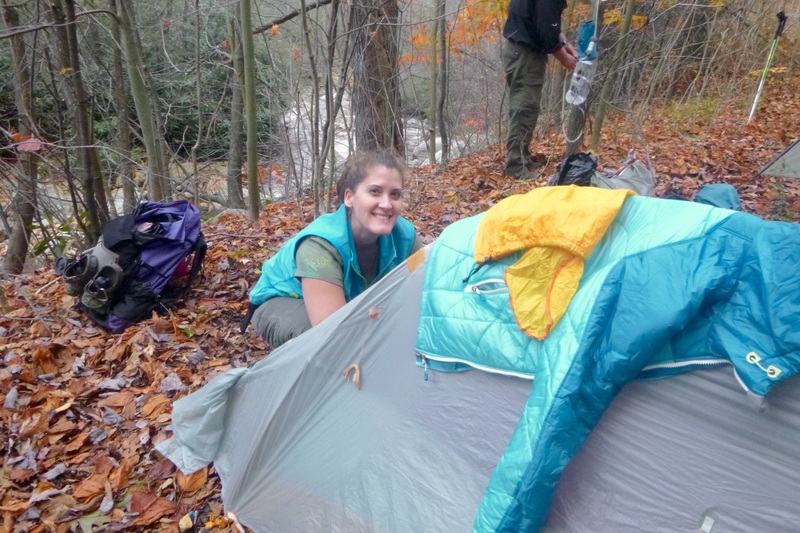 Immediately upon starting off we had to take off our boots and make an uneventful ford of the creek where as luck would have it, found a great campsite just on the other side. For next time. The trip description we were using was pretty easy to follow at first. 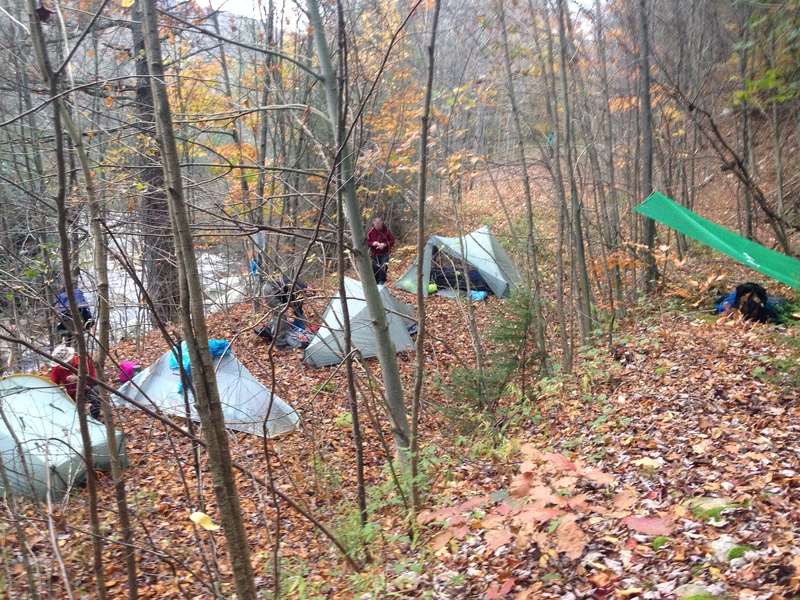 Our first section had us following blue blazed trail winding up to the plateau that Roaring Plains is known for. But wouldn’t you know it, about 10am it started to drizzle. About an hour later the drizzle got a little harder and the temps dropped into the forties. And for extra fun, the breeze started to pick up. 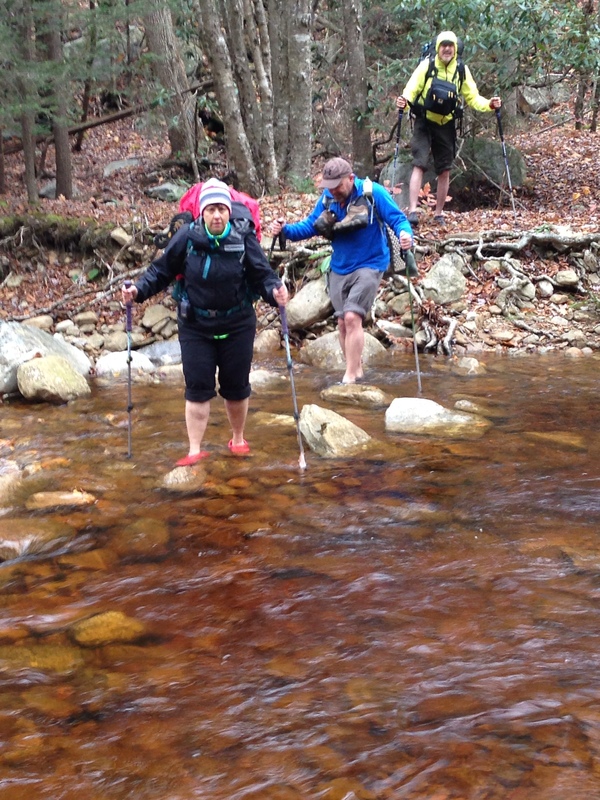 More creek crossings. 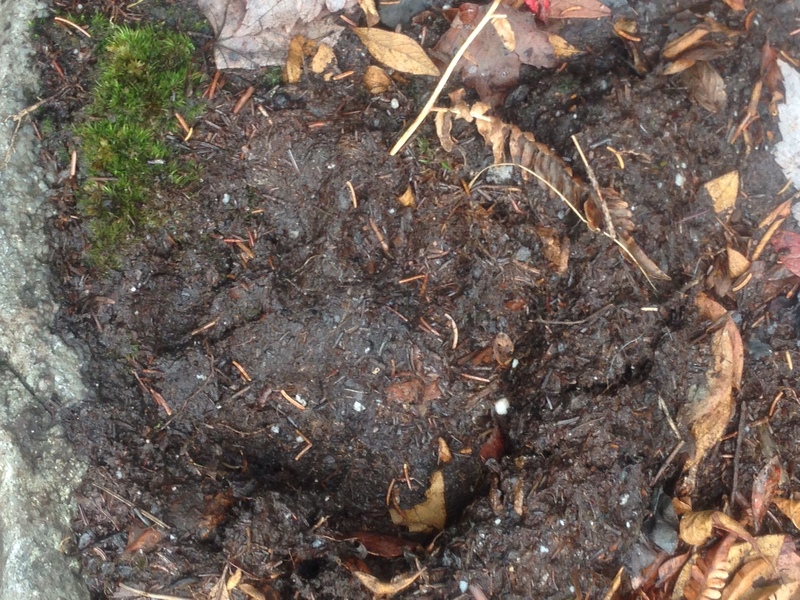 Bear prints in the mud on the trail. So on we slogged. I will say that the drizzle did stop for a while, at times, and the sun would start to peek out. And our morale would rise. But then just to mock us, the skies would laugh and cloud back over and the drizzle would begin anew. 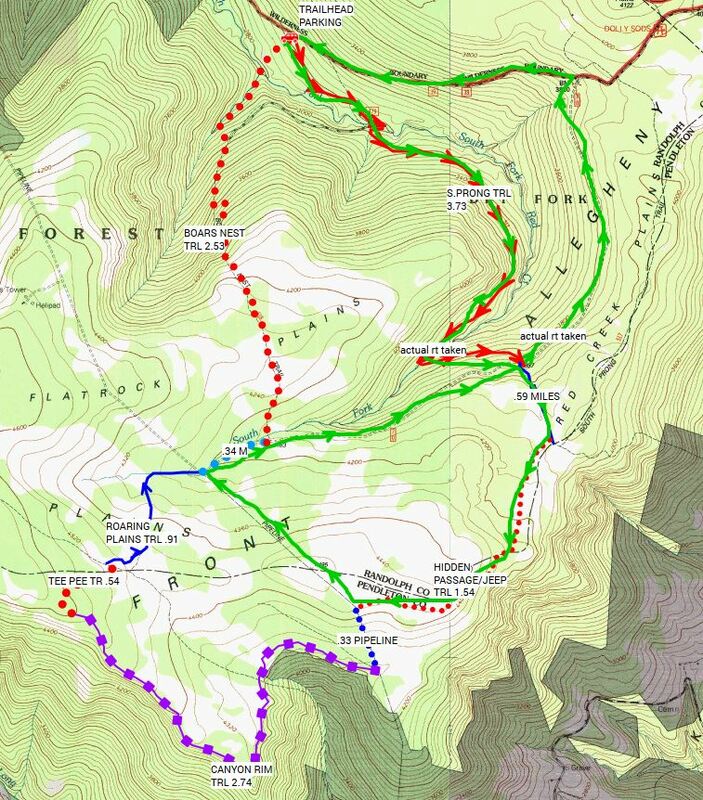 We followed the South Prong Trail up to the plateau but then marched past the right turn onto the Lost Passage Trail. 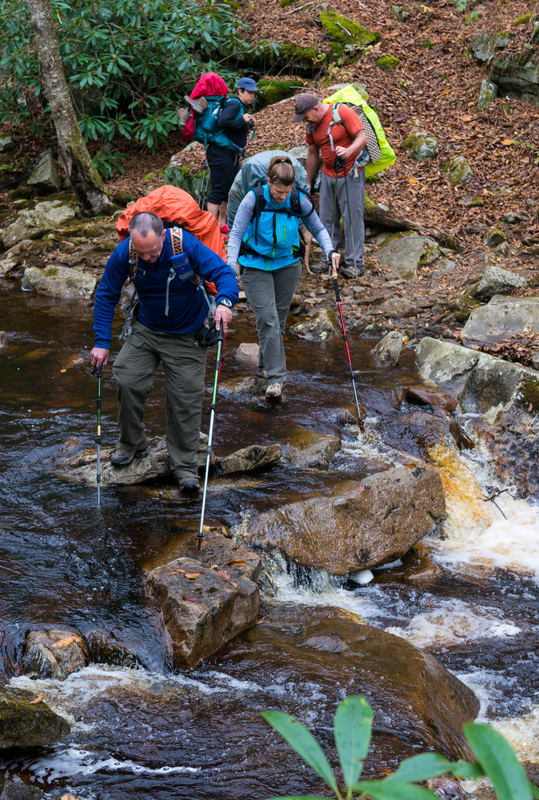 Once we discovered our mistake, after about a quarter mile, we backtracked and got on Lost Passage. Here’s where things got a bit tough. There were several trails headed in more or less the general direction we wanted to go. Some seemed more obvious than others. We followed a well worn path just to have it die out in the brush. 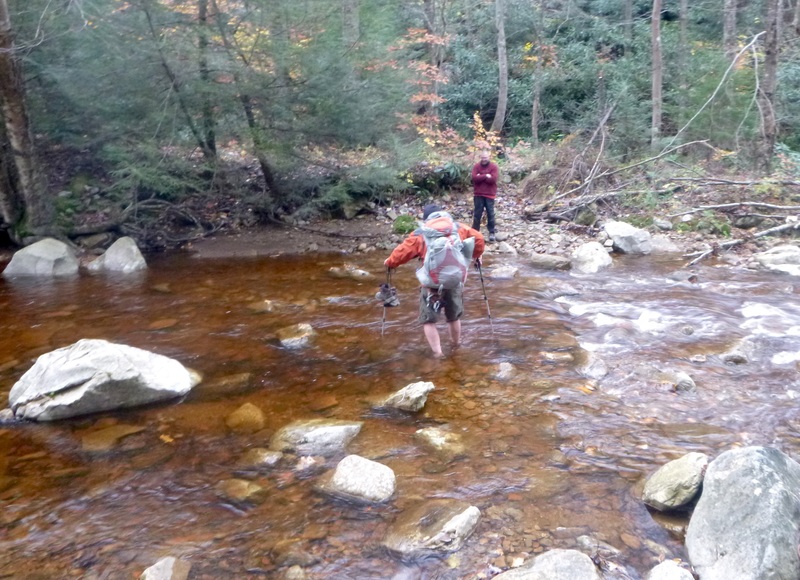 We crossed a creek and tried to follow a few others, just to see those come to a dead end. Gunny went back across the creek to check out a faint path that had seemed to die out in the bushes. He followed it for a bit and determined it was probably the main trail. A check on the GPS after a few yards confirmed it was headed in the right direction. 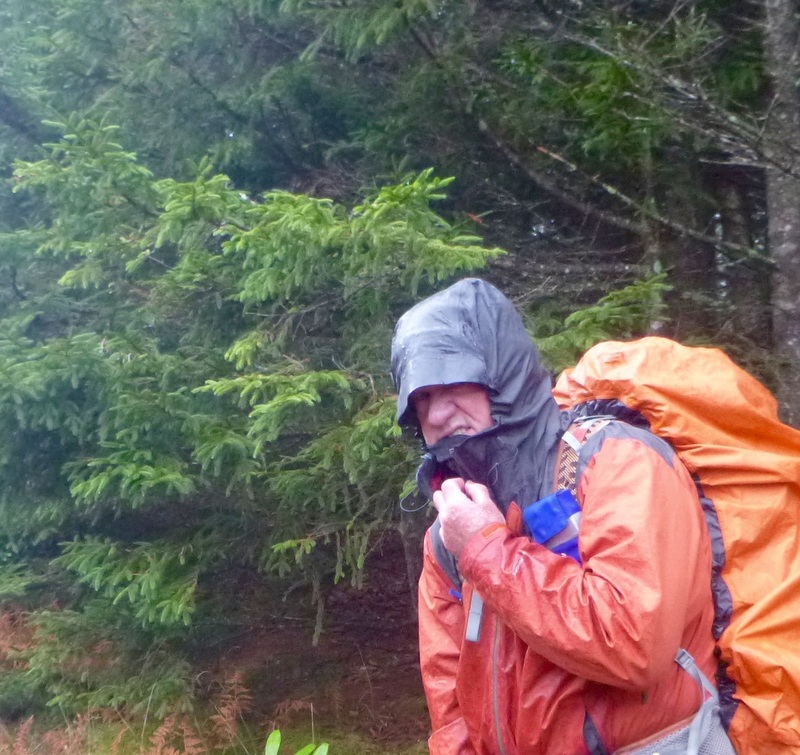 By the time we got to the Pipe Line Trail, it was raining pretty good. And cold. And Windy. Time for winter hats and gloves. The clouds had settled in at our altitude so no valley views and no views of anything more than a half mile or so. We noticed that the Pipe Line Trail is a huge right of way, maybe a hundred feet wide with a dirt maintenance road and a good foot trail, and it was running both south (our direction) and north. What’s more, earlier in the day, when the South Prong trail crossed what appeared to be just another old dirt road on the USGS topo map, that road was actually WV Forest Road 70, a very well maintained gravel road with quite a few trucks running up and down it carrying hunting dogs. We had been listening to the distant howling of the dogs for several hours and had even had a few pass us on the trail. It appeared on the map that we could bail out now and follow the Pipe Line Trail north to where it intersected FR70, then take FR70 east for a few miles to where it intersected FR19 a few miles below from where we were parked. This would bypass the Canyon Rim Trail (which we couldn’t see) and allow us to skip a muddy 1500′ descent on the Boar’s Nest Trail to the trail head. 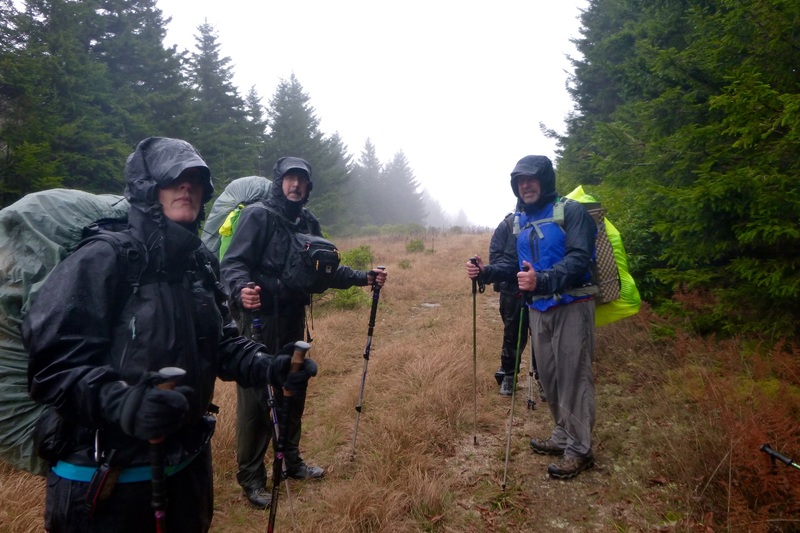 The descent to FR70 on the Pipe Line Trail was a bit sloggy in the rain but once we hit the gravel road we were able to make good time. So about 3 hrs after we made our decision to bail we were back at the cars. We stopped at our favorite local restaurant for dinner and some peanut butter pie and coconut pie and it was great! We convoyed back to Verona, stopping to pick up groceries, and stayed at Gunny’s new house. With plenty of craft beers and chips and salsa we had a great time swapping lies late into the evening. 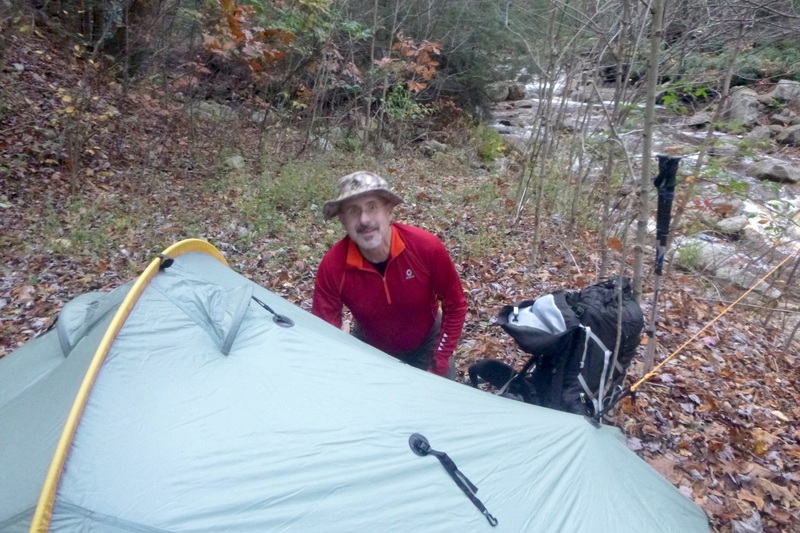 This entry was posted in Backpacking, Hikes in Virginia, West Virginia Hikes and tagged backpacking, obsessive compulsive backpackers, SETTING UP TENT IN RAIN, tent on November 4, 2014 by Dragin.